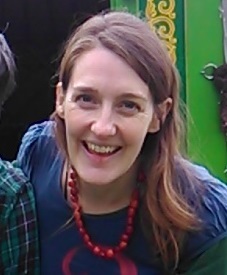 Nell Seal is a Secondary Geography trained teacher who has worked in environmental and outdoor learning for 16 years in both the charitable and the public sector. Nell is now a freelance consultant specialising in facilitating CPD training in the areas of learning for sustainability, outdoor learning and primary Geography. Nell graduated in 1998 with an Ecology degree from the University of East Anglia (UEA), packed all of her belongings into her mini (and her bike onto the roof) and headed to Flatford Mill deep in Constable Country on the Suffolk/Essex border to become a centre assistant at a residential field study centre. Nell’s career with the Field Studies Council saw her move into a Graduate Assistant Tutor role where she undertook an NVQ in Outdoor Education and the seed was set! Nell became their Ecology Tutor not long after and enjoyed teaching Primary and A level groups. A Masters degree back at UEA in Applied Ecology and Conservation gave Nell the chance to develop her interest in balancing ecology with human needs (and wants) and upon graduating worked in the charitable sector again, this time for EnCams working with Local Authorities on Local Environmental Quality. After a couple of years Nell realised she missed working with children so took a new role coordinating a four year Learning for Sustainability Project for a field study centre in the Norfolk and Suffolk Broads: How Hill. It was at How Hill and via partnership working that Nell met Susan Falch-Lovesey whose dynamism and dedication continue to be an inspiration. Sue enabled Nell to obtain a PGCE with the Open University alongside her work. It was in 2007 that Nell’s dream job became vacant and she was lucky enough to be appointed to oversee Wells Field Study Centre on the North Norfolk Coast in a role that combined management with contact time with children. Nell spent three of the happiest years of her life playing on the salt marshes and beach with Key Stage 2 children from Norfolk and further embedding sustainability into the ethos of the centre. Nell’s next challenge was to become Adviser for Sustainable Schools for Norfolk County Council with a cross-phase responsibility across all Norfolk schools. It was during that three year period as an Advisory Teacher that saw Nell experience bereavement, marriage, a house move, motherhood and her husband’s relocation for work. That heady mix forced a re-evaluation and Nell now enjoys working freelance two days a week and five days a week as a Mummy. Nell worked with fellow cool and groovy person Louise Ambrose to write ‘Step Outside’ and ‘Beside the Sea’. She has also written articles for Primary Geography Magazine. Nell is a consultant to the Geographical Association, is proud to be a Primary Geography Champion and regularly skips back to work for Norfolk County Council as an Associate. Nell migrated from Norfolk to as far from the sea as you can get and now lives in Clophill, Bedfordshire with her husband Terry and daughter Primrose who gets to learn by stealth outdoors every day of the year.